This is the tutorial of the look i promised you girls on facebook. It’s an Arabic bridal look with bright colours. Arabic makeup is all about the eyes as most of you know and is my most favourite type of makeup also! 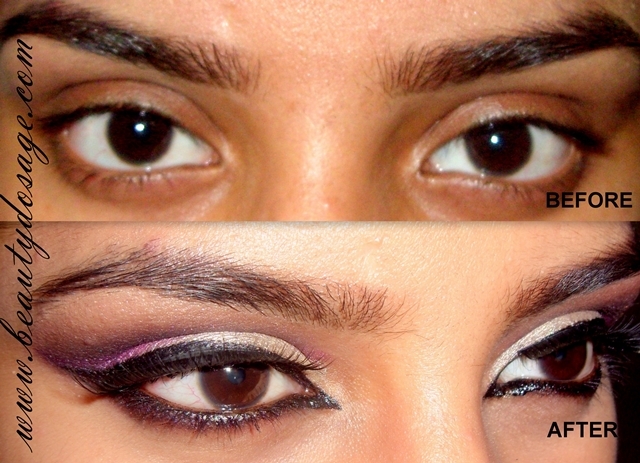 Check my previous Arabic eye makeup tutorial HERE. Let’s get started! Prime your lids with a skin tone base or even a white one would do. This is important for any look where there are bright shadows used. Pat a champagne shade all over your lid. It’s better to foil the shades to make them more vibrant. Draw an outer V with the black gel liner and winging it like a cat liner. Blend the black gel liner with black eye shadow and blend away the harsh lines. Place a violet shade in between the champagne shade and black shade. And slowly buff the shade without over powering the black shade. Blend away the harsh edges with a lending brush that’s slightly smaller than the usual. Highlight your brow bone with the same shimmer champagne shade we applied on the lids. 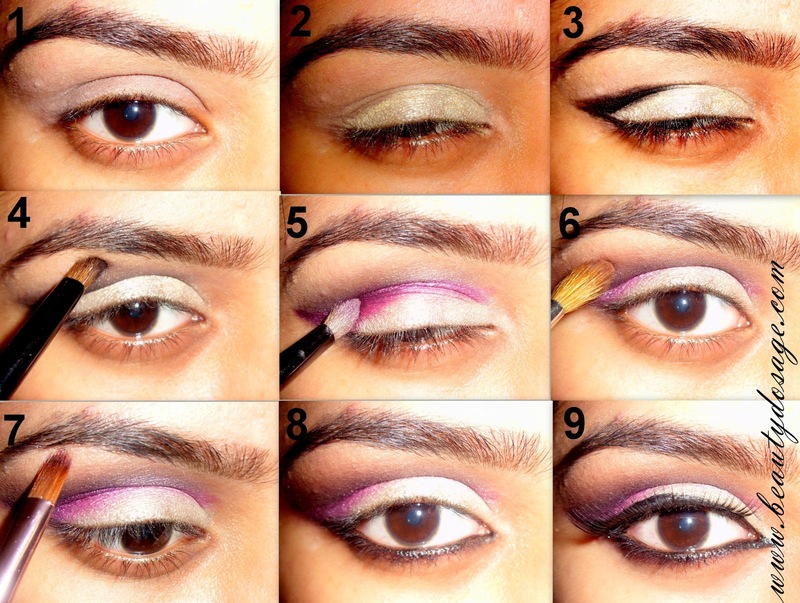 Apply the gel liner on the lower lash line and blend it with a plum eye shadow. Line your upper lash line and apply false lashes. Use a pair that has a cat eye shape that has longer hair at the end as these are the most suitable for this type of look. That’s it girls! Hope you try this look. It looks lovely with Indian attire if you’re attending a wedding or special occasion. Thank you so much for your comment!! I follow you via GFC and bloglovin(#10)! Loved it Jeeshan! its so bridal. U have applied false lashes very well. I just couldnt apply it. Thanks Megha if your finding it difficult you should always practice with lashes that have an invisible band or really thin ones. those can be applied really quick :) and ofcourse use tweezers trust me they help alot ! very pretty, even I like your falsies.. and that palette is so cute.. Thanks for the comment on my blog.wud follow u back. OMG!! I just fell in love with the eye shadow palette! !